Dragon Force 65 är designad av tre mycket erfarna radioseglare från England, Mark Dicks, John Tushingham och Micke Weston. Den har introducerats i Europa och övriga världen med mycket stor framgång. Redan 2013 hölls mästerskap i England och Holland. Bara i England såldes 1500 båtar på 5 månader. I USA har flera radioseglarklubbar antagit Radioseglaren som instegsbåt i Radiosegling. Priset, samt att den är mycket väldesignad och välseglande, har banat väg för den stora försäljnings framgången. Här en av skaparnas berättelse om vägen fram till i dag. After a discussion with John Wesley (Ripmax rep) some 3 years ago I tested the original Joysway fleet (Caribbean, Fiesta & Discovery) that were all typical mass produced model yachts – heavy, over-rigged, unbalanced etc. Mark Dicks & John Tushingham were called aboard & we all met at Swanley Park using a Micro Magic & 2 RG65 yachts we demonstrated what a decent designed yacht could do – running rings around the Joysway fleet. Suitably impressed John Wesley asked us to design a radio racing yacht for Joysway to mass produce. We only had 6 weeks to produce a design & for this reason we went for a current class & design – the Mark Dicks RG65 “Ice” modified with its transom slightly pinched in. With Ripmax, I met the Joysway team (Stanley, Johnson & Giggs) at the Nuremberg Toy Fair in February 2012 to discuss the project & explain exactly what was required for a radio racing yacht. With new design & a RG65 Ice in hand Joysway dually went back to China & we waited in anticipation for what would arrive later in the year. We received the first prototype late 2012 – blow moulded, random fin box/mast housing unit & rudder housing unit – we took a step back to appreciate what had turned up. The fin was in line with rudder & all in line with the mast, mast slider to adjust rake, shroudless rig, rotating the mast ball race kicker/gooseneck fitting etc. etc. – almost there!! The hull was a bit heavy & ballast was slightly too far back as the transom was in couple of mm – but what a good job Joysway had done & what a totally new look at the engineering of a hull. We then asked if the hull could be made lighter & whether the ballast could be moved further forward – two further hulls arrived but these were too light and started falling apart but it was too late to change the ballast so we suggested that the batteries could be housed by the fin box so as to bring the weight forward. We all met again at Nuremberg Toy Fair February 2013 where the DF65 was displayed for the first time on the Ripmax stand & to discuss any further modifications that might be required. We all celebrated that evening & this went on to the early morning – very messy. The first batch arrived in May which now in full production had a couple of issues mainly a few were very weak at the top of the bow needing reinforcement. The second batch had a modified bow which eliminated the problem & different bow elastic sheeting fitting. The third version is now in production – this has a plastic servo tray & modified switch. Two other improvements are in the pipeline – all metal main boom compression strut for easier construction/adjustment & mast/boom support rings to stop them splitting. These will not improve the performance of the yacht only the construction. Unfortunately John Wesley passed away just after the Toy Fair but he did at least see the DF in production form – he will be sadly missed & we have named the UK DF National trophy in his honour. We envisaged a few issues with the DF65 as part of the RG65 class & the problems of a class within a class – the DF would be at least 120 grams heavier & would not compete the development RG’s. As stated before, because of the timescale issues we needed a ready available class/design & recognised the RG65 class & Marks “Ice” as the best option. You can sail the DF as an RG65 with swing rigs, high aspect sails & make as many modifications as you like – you can also sail within the restricted rules making the DF an affordable option with close performance sailing – you can also make your own rules as its your yacht. I would like to thank John Tushingham for all his time & effort into the concept of the DF & work on the class rules. 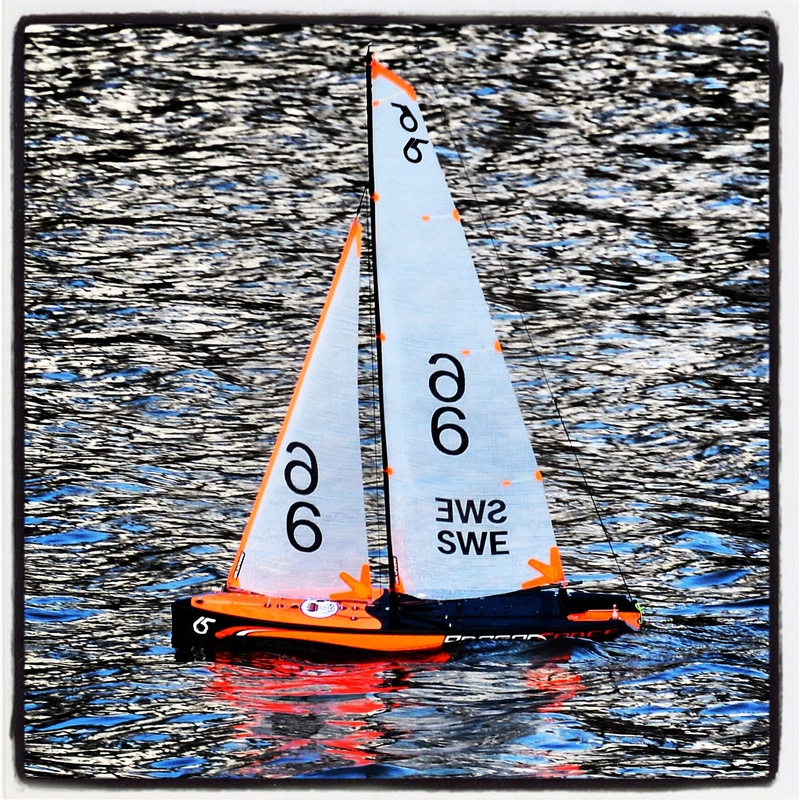 This is ours & Joysway first attempt at producing a radio racing yacht & although not perfect defiantly big improvement to the normal toys & defiantly value for money. As stated before – your constructive criticism is welcome. May your force be with you! !